An unofficial terrorist banker named Le Chiffre has stolen money from his customers. Yet the game isn’t over; the money is part of an exclusive poker tournament. The MI6 sees the opportunity to get the money back and sends James Bond to play in the tournament. 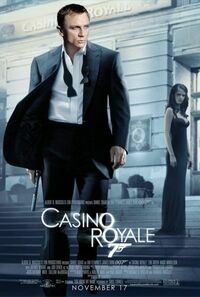 The 21st film from the Legendary James Bond series starring Daniel Craig in his first roll as the British super agent.